The European plate has a 4.5 Gy long and complex tectonic history. This is reflected in the present day large scale structures. The new digital Moho depth map is compiled from more than 250 data sets of individual seismic profiles, 3D models obtained by body and surface waves, receiver function results, and maps of seismic and/or gravity data compilations. We have compiled the first digital, high resolution map of the Moho depth for the whole European plate extending from the Ural Mountains in the east to mid-Atlantic ridge in the west, and from the Mediterranean Sea in the south to the Barents Sea and Spitsbergen in Arctic in the north. In general three large domains within European plate crust are visible. The oldest Archean and Proterozoic crust has thickness 40-60 km, continental Variscan and Alpine crust has thickness 20-40 km, and the youngest oceanic Atlantic crust has thickness 10-20 km. 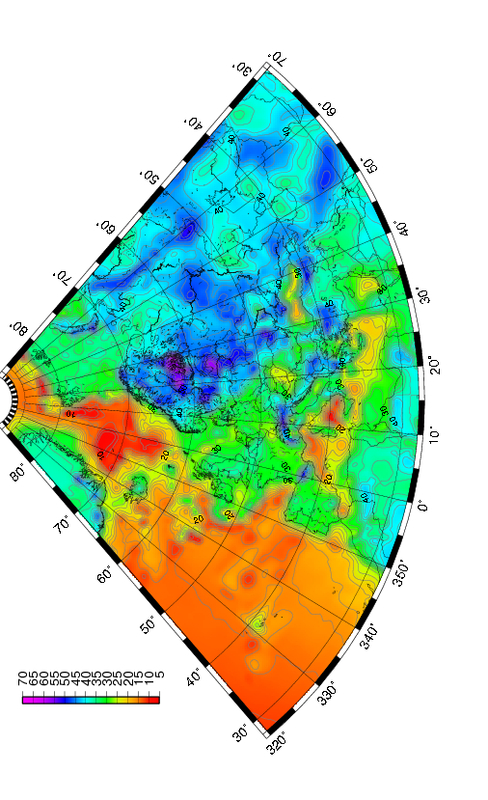 An estimation of uncertainty has been computed for the area of the Moho map. # ESC Working Group comprises: M. Behm, A.A. Belinsky, D.C. Booth, E. Brückl, R. Cassinis, R.A. Chadwick, W. Czuba, A.V. Egorkin, R.W. England, Yu.M. Erinchek, G.R. Fougler, E. Gaczynski, A. Gosar, M. Grad, A. Guterch, E. Hegedus, P. Hrubcová, T. Janik, W. Jokat, E.E. Karagianni, G.R. Keller, A. Kelly, K. Komminaho, T. Korja, J. Kortström, S.L. Kostyuchenko, E. Kozlovskaya, G. Laske, L. Lenkey, U. Luosto, P.K.H. Maguire, M. Majdamski, M. Malinowski, F. Marone, J. Mechie, E.D. Milshtein, G. Motuza, S. Nikolova, S. Olsson, M. Pasyanos, O.V. Petrov, V.E. Rakitov, R. Raykova, O. Ritzmann, R. Roberts, M. Sachpazi, I.A. Sanina, M.C. Schmidt-Aursch, I. Serrano, A. Špicák, P. Sroda, F. Šumanovac, B. Taylor, T. Tiira, A.G. Vedrentsev, J. Vozár, Z. Weber, M. Wilde-Piórko, T.P. Yegorova, J. Yliniemi, B. Zelt, E.E. Zolotov. Grad, M., Tiira, T., and ESC Working Group, 2009. 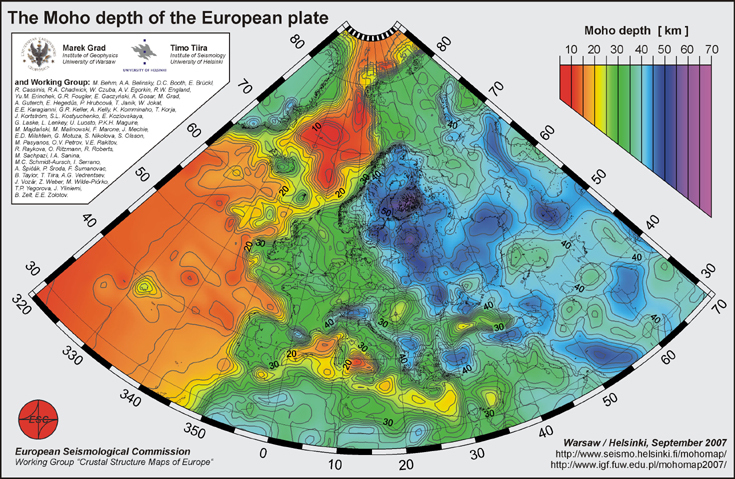 The Moho depth map of the European Plate, Geophys. J. Int. 176, 279-292. doi: 10.1111/j.1365-246X.2008.03919.x. Figure 1. The Moho depth of the European area. A4-size jpg and tiff. Moho map with title and information. The Moho map covers area lat 28N-86N, lon 40W-70E. The ascii- and grd-files cover area lat 27N-87N, lon 41W - 71E. The grid-files have 1 degree larger area on each side to help plotting areas at the edges of the map. Please note, that the data coverage outside 28N-86N, 40W-70E is poor and therefore the moho depth values and the uncertainty estimations outside the study area are not reliable. New additions to future upgrades of the Moho map are welcome.